WARNING: The following article contains major spoilers from the midseason finale for Season 7 of Arrow titled “Unmasked”. Do not read if you have not seen the episode or read ahead at your risk. The identity of the new Green Arrow was finally unmasked in the midseason finale of Arrow on Monday night. And she is a lot closer to Oliver (Stephen Amell) than he realizes. At the beginning of Monday’s episode and in the end, the new Green Arrow is seen. The show opens with a woman working out, much like Oliver did in the first season. It ends with this woman at a grave saying “Dad, Oliver and I are more alike than I thought.” The headstone was that of Robert Queen. That’s right! The new Green Arrow is Emiko Queen (Shea Shimooka), Oliver’s half-sister. Fans of the comics know she is the daughter of Robert and Shado. But as we saw in the first two seasons, Oliver’s main love interest on Lian Yu was Shado. So it will be very interesting to see how the show reveals details about who Emiko is. This raises even more questions, like why is she there? What does she want? And where has she been all this time? We get a few hints: she looks down on Oliver and has had some very specific training. Looking back, we should have guessed it was Oliver’s sister. I mean, she was crossing names off a list as Olly did in Season 1 for crying out loud. The midseason finale also sees Oliver re-adjusting to life after prison and it is very clear he’s a changed man. He suited up for the first time this season but with a twist – he is now working for the Star City Police Department, much to the anger of the new Mayor. Oliver attends a banquet in his honor for all the work he did to reveal the truth about Level 2. While at the event, a Green Arrow imposter killed one of the guests. Oliver, Rene (Rick Gonzales), and Dinah (Juliana Harkavay) team up once Olly learns his old buddy, Max Fuller, is behind the killings. So Olly suits up as the Green Arrow (without a mask) to help the SCPD capture Fuller. Olly also deals with some relationship drama with Felicity (Emily Bett Rickards). After Fuller targeted their home, Felicity takes out a gun and fires a shot, much to the shock of Oliver. After an emotional and intense conversation, Felicity tells Oliver what’s best for her at the moment may not be best for their relationship. Is an Olicity divorce in the works for the second half of the season? We’ll have to wait and see. Given what we’ve seen of the flash-forwards so far, the future doesn’t look bright for our main couple. Speaking of the flash-forward, we got some glimpses into the future and it only raises more questions. 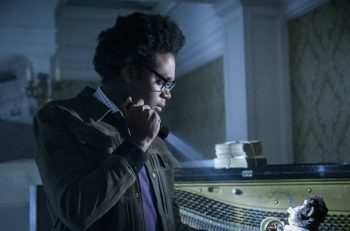 William, Zoe (Andrea Sixtos), and 50-something Dinah track down Blackstar/Maya (Katherine McNamara) and got some key intel about future-Felicity. She revealed that Felicity came to her wanting more equipment for bombs. After they do a quick search of her office, the trio discovers Felicity is actually planning to go through with the bombing. 50-something Dinah suggests going to the Glades for help and sends Zoe. This is an interesting development because it seems Rene has some major influence over The Glades and Zoe is protected. How Rene got into power (or at least became somewhat powerful) is still a big question, but we may have seen this beginning to take shape. In the present time, Rene is at Oliver’s reception. He comments to present day Dinah on how rich people there aren’t serious about prison reform because they don’t use their money to help the poor, who often turn to a life of crime. Dinah suggests he run for office and it looks like he did some form of that in the future. I hope Arrow stays on the air until Season 10 because this future stuff has me really intrigued and has breathed new life into this show. Elsewhere in the episode, Lyla (Audrey Marie Anderson) and Diggle (David Ramsey) discover Argus is investigating something having to do with the Longbow Hunters. They turn to Diaz (Kirk Acevedo) for help. But this is Diaz, his help will come at a major price. The midseason finale was the strongest start to a season since the first two and has so many fans flipping Arrow back on. But one question remains: Where was Roy Harper? Arrow returns with new episodes on January 21 and the Arrowverse crossover “Elseworlds” premieres this Sunday at 8/7c on The CW.